Congratulations on choosing occupational therapy as a career. By now, you may have begun exploring graduate programs, and discovered that completing prerequisite courses with a 3.0 or higher grade point average is an important part of your application. The news that before applying to a two to three-year graduate program, you will need to take up to a dozen classes or maybe more is daunting. Creator of OT Salary Survey Kate Washa Boyd shared in her blog post about her transition to occupational therapy as a second career that she had to take prerequisites to some of her prerequisite courses! 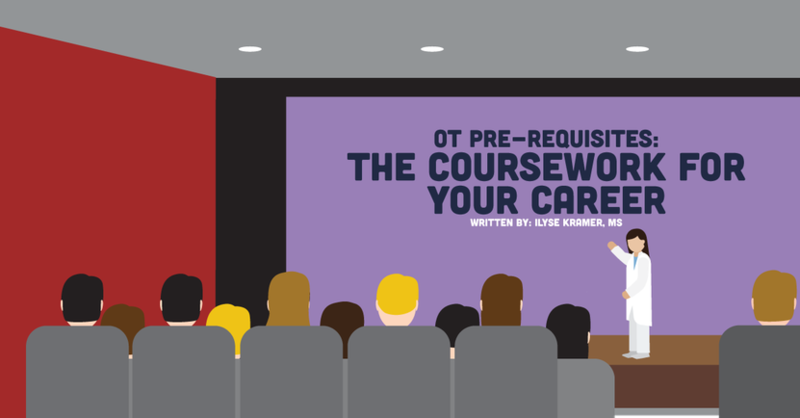 I am in the process of completing my own prerequisites and have written this article to help my fellow OTs navigate the process of taking prerequisites and share tips for success. While this article can be applicable to all prospective OTs, most of the advice is geared toward prospective occupational therapy students who already have an undergraduate degree in an unrelated field, and/or are considering occupational therapy as a second career. After that, the variety can get a little confusing. Some programs require one or two courses in the natural sciences. While one program may state that either Biology or Physics will fulfill that requirement, another program will insist on both, or that one science class cannot be substituted for another. Other programs may require additional psychology or sociology classes. For example, Thomas Jefferson University requires Cultural Anthropology or Multicultural Psychology to give students a foundation in cultural competency. Washington University in St. Louis wants an advanced (200 level or above) life science course that could include pathophysiology, zoology, botany, or ecology. This sentence merits a “duh,” but it is so important to understand exactly what prerequisites you need to take, and to be certain that the courses you are taking meet the schools requirements. You do not want to be prematurely rejected from a program because you misinterpreted its prerequisites and didn’t complete the correct course. Or spend money on a course only to discover you didn’t need to take it. To avoid these mistakes, the first step is to get a clear picture of what the prerequisites from each of the programs you are considering are. To get this clear picture, I recommend making a list. I made a chart using Excel spreadsheet with the schools in the first row, and the names of prerequisite courses at all the schools I was considering down the first column. Then, I played Battleship, and marked the courses that each school required with an x. This way, I could see the total number of courses I would need to take, along with what courses were common across all programs, and which courses were individual to a specific school. Where to Go Back to School? We’ve conquered the what, now onto where. To find the best cheapest option for taking your classes, I recommend looking at your local community college. If the courses you need aren’t available, what do your public universities offer? Most OT programs don’t have care where you take your prerequisites as long as the school is regionally and nationally accredited, but don’t be afraid to reach out to the OT program directly to ask them any questions you may have. You should be able to enroll as a non-degree student. However, your local college or university may not offer every course you need. For example, one of the schools I am applying to requires medical terminology, which is not offered at my local community college or state university. I was able to take this class online through University of California San Diego’s Extension Program. In general, OT programs want the science courses that include labs to be completed in person, but may allow you to take some prerequisites online, especially if you cannot find options to take the class in person. If you plan on taking a course online, I recommend getting direct confirmation from the program’s admission staff and sharing the link or syllabus to the online course you are considering with them. Again, you don’t want to invest time and money in the class unless you are certain it satisfies the prerequisite. Don’t be afraid to bombard OT schools’ admission staff with your questions. You can’t bug them too much or ask too many questions. Their job is to ensure you have the information you need to apply to their program. When to Go Back to School? Now for when. OT schools use your prerequisite grades to gauge how you will perform in their program. It benefits you to have most prerequisites completed at the time of your application, so you can provide as much evidence as possible for how you’ll ace their program. However, if you can’t complete all courses at the time your application is due, don’t worry. Most programs are fine with a few outstanding courses provided they are complete by the time their program starts. If you are unsure of the stance of the programs you are applying for, keep that admission contact’s number and email handy. The awareness that OT programs will assess the grades you are getting in your prerequisites to decide whether you are a good fit for their school can add pressure to every test, quiz, and paper. However, keep in mind that the goal of learning anything is ultimately knowledge not perfection, and making this a mantra can help keep you from becoming overwhelmed. Coming from a liberal arts background, I’ve enjoyed the opportunity to study subjects so different, but are essentially about the same thing — exploring what it means to be human. A subject that can be particularly hard to stay afloat in is Anatomy and Physiology due to the barrage of information coming at you hard and fast. To make this information more digestible, I relied on several strategies to make learning more entertaining. There are a ton of YouTube videos that cover every system in the human body in short chunks. Since the subject is so visual, drawing, coloring, and diagramming is a fun way to retain what you are learning. Mnemonic devices like this one to remember cranial nerves: “Oh, Oh, Oh, To Touch and Feel Very Good Velvet, Such Heaven,” are so goofy, that they can’t help but to be burned into your brain. In the middle of a test on the digestive and endocrine system, I found how effective humor can be at helping you retain information. I remembered that the comedian Julian McCollough has a routine about his burst appendix where he equates his appendix and liver to employees who respond very differently to their respective jobs. If there’s a class you particularly excelled in, or a professor with whom you connected, consider asking them to write you a letter of recommendation. Most OT programs use a common application system called OTCAS (Occupational Therapist Centralized Application Service). OTCAS has an official open date in the third week of July and requires that you send all official transcripts to their headquarters in Massachusetts. OTCAS also requires you to manually enter your transcript information into their system. A Quality Assurance team reviews your manual entries against your official transcript for inaccuracies. The entire process takes about six weeks, so factor this into your timeline for completing your application. Do you have any suggestions for future OTs about prerequisites — what, when, where, and how you were successful? Please share it with us in the comments!